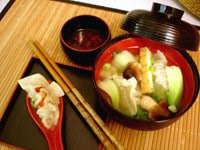 Wontons and toufu with lettuce, straw mushrooms in soup. In this post, I want to focus on weeknight dinners. Hence the One-Dish Wok Meals. There are so many beautiful food blogs to get recipes from (see sidebar), so what I want to do is share a different approach to cooking. It’s stress free because you don’t have to run out for special ingredients, follow a recipe and there’s very little cleanup. 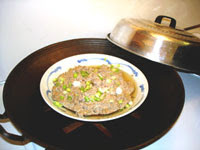 Cook the gourmet dishes when you have more time. 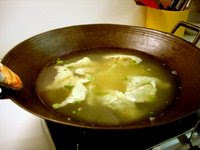 Yes, I cook my wontons in my wok. 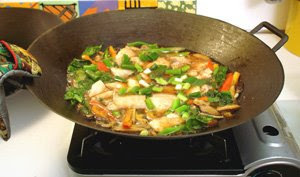 Single guys tell me they enjoy showing off their wok cooking to their dates! This made me laugh especially when they said it makes them look like they know what they’re doing. My posts: Keep Cooking Simple and Tasty, Wok Up Your Own Creations and Stir Frying Without Recipes will give you the complete scoop on how to achieve this. 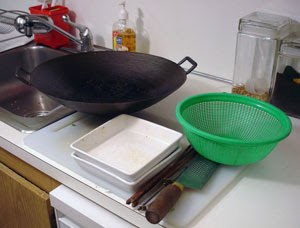 Why a wok? Because it heats up fast, cooks fast and washes up fast and best of all, you can use this one pan for cooking EVERYTHING, not just Asian stir frys. Less clutter, less oil, less washing up. 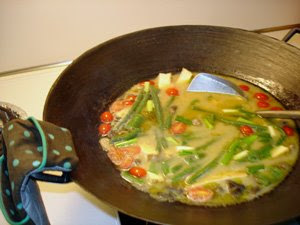 Toufu, green beans, cherry tomatoes, straw mushrooms cooked in CurrySimple’s Green Curry Sauce. Simple stir fried bok choy and red bell peppers with dash of tamari and sherry. 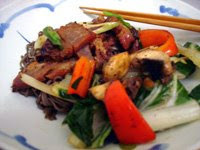 Buy Char Siu (Chinese roast pork), mix with bok choy dish, dinner! One-Dish Wok Meals is how my husband and I eat most weeknights and we never get tired of them. It’s really a no-brainer, it gives you the right balance of protein and carbs. That’s how I was brought up, lots of veggies, less meat. I cut out eating starch a while back because I’m on the cusp of Type II Diabetes, I discuss this in Healthy and Delicious Snack Ideas. When my doctor first told me to cut back eating so much rice, I thought she didn’t realize I was Asian! Asians eat rice at every meal. I cut back a little at a time and finally didn’t miss not having it at all. When I understood starch drives up sugar levels, it was easy to give it up and see my energy soar. As mentioned, we’ll have quinoa more often than rice or noodles. I get into more depth about Diets on my website. I hear amusing stories from many husbands who are relegated to washing dishes, so you’ll be pleased to know it takes less than two minutes to wash up for a One-Dish Wok Meal. A typical washup takes less than 2 minutes. 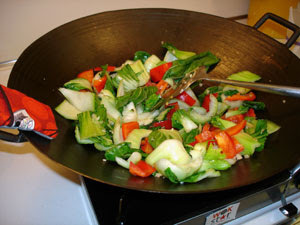 As you can see, I use my cast iron wok for cooking many different things! I’d love to hear what you cook up in your wok? Tilapia with veggies in soup.